View team schedules and learn more about our Physical Education program. 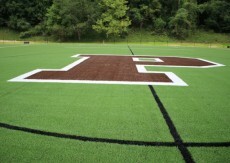 Park’s Kelly Field AstroTurf opened in the fall of 2014. Lined for field hockey, lacrosse, and soccer competition — with the soccer field scaled at collegiate dimensions — the expansive surface also includes a conditioning track, highlighting the optimal cushioning characteristics, along with the traction and torque release properties of this latest generation in field technologies. Interscholastic Athletics: From Grade 4 in Lower School, through Middle School, and competitive varsity level teams in the Upper School, Park emphasizes a balanced approach. We teach fundamental athletic skills, conditioning and fitness, game strategy, and the lifelong skills of perseverance, commitment to a common goal, overcoming adversity, and winning with humility and integrity. Led by two full-time athletic directors, our teacher-coaches build personal relationships with their student athletes that mirror the values, habits of mind, and character nurtured in the classroom. We value both participation and a competitive spirit. In the Lower School and Middle School, all students who wish to come out for a team are included and receive playing time. Beginning in the eighth grade, and increasing each year through junior varsity and varsity levels, coaches encourage all players, but skilled and dedicated athletes receive the majority of the playing time. It is our goal to field competitive teams and win our share of games, playoff victories, and championships. Both boys and girls play in highly competitive leagues, the MIAA and IAAM respectively. Park’s comprehensive physical education program is offered to Lower and Middle School students. In Upper School, students choose between participation in interscholastic athletics and physical education electives, including outdoor education, ultimate frisbee, climbing wall, yoga, and fitness and strength training. The mission of the Physical Education Program is to provide students with the basic foundation of motor and manipulative skills, an understanding of the importance of physical fitness and sport, and the opportunity to develop effective personal and social skills. Students will be provided the opportunity and information necessary to make decisions about physical activity for their personal challenge, enjoyment, health, self-expression, and social interaction. Our goal is to promote a positive learning environment that meets the needs and abilities of all students and encourages them to maintain a physically active lifestyle. • 65% of Upper School students participate in interscholastic athletics.